Projection one comprises the contestants of the first season of the reality show ‘Americas Next Top Model’. However the artist has carefully captured only those brief moments when the individual female contestants break down and cry. These sequences have been crudely compiled in the exact order of their appearance on the series. The footage has also been digitally zoomed in on, to show only those intimate gestures that accompany the contestants’ moments of grief – extreme facial close-ups of eyes, tears and hands. Sudden breaks in sound and dialogue and senseless jump-cuts characterize this new narrative. 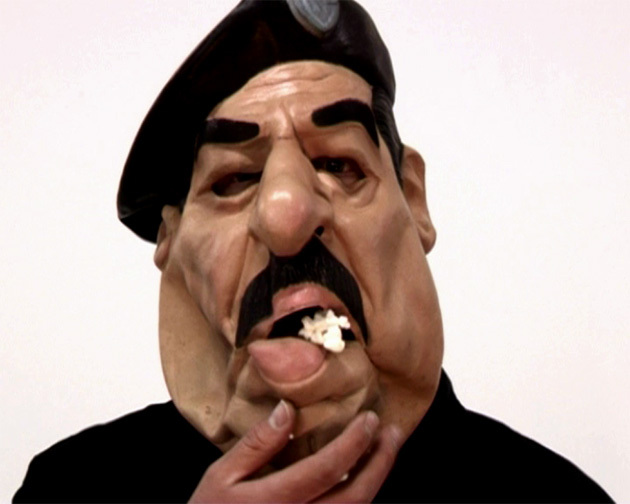 In the second video channel, projected on an opposite wall, Thom appears wearing a crude, rubber mask of former Iraqis military dictator Saddam Hussein. Staring blankly into the camera, he abjectly smears popcorn all over his face, shakes his fists and distorts the already gaping mouth by shoving his whole hand into it – all whilst consuming vast amounts of his favourite television-watching snack. The viewer cannot help but experience themselves as an intruder in this absurd exchange: they become physical props animating the artwork as the dimension of the projection room is such that the viewer can never see both images at once – forcing them to move into one projected image in order to view the other. The work was produced for the group exhibition ‘A Legacy of men’ curated by Jacki McKinness at the Johannesburg Art Gallery, 2007. Other artists included Mikhael Subotzky, Lawrence Lemaoana, Robert Hamblin, Pierre Fouche, Nicholas Hlobo and Kemang Wa Luhere.